Why not make one for your friend? This pink friendship greeting card started off not so successful. It was made after dinner and by then I was quite tired but my heart was set on making a card for a lady friend to tell her how much I appreciate her for being my buddy. Friends are important! We should treasure our friends and let them know once in a while how much they mean to us and that we appreciate their friendship very much. Don't be caught up with our works, and other activities and neglect our friends. We should always make time for them. I had this buddy card design in mind when I started on making it. First, I cut the pink card stock, score and fold it. Then punch that beautiful shell design border by Martha Stewart with a brown design scrapbooking paper. Placed it over the white card and wrap a nice pink ribbon over it at the joint. I was in a hurry to add the little pink sparkling gem. Love that! When I ink the Friendship rubber stamp with VersaMagic midnight black chalk ink, it just didn't work for me. The ink smudged on the white cardstock and the print just did not stand up as the ink was not strong enough. 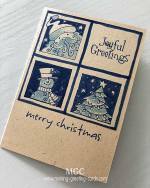 Stamp the message on another white card with Memento tuxedo black ink. Round corners and sponge with Memento angel pink ink. 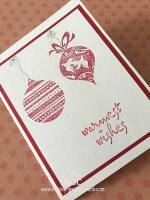 Use double-sided foam tape to attach to card covering the earlier stamped mistake. Die cut flourish with the brown design scrapbook paper. 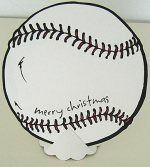 Use double-sided foam tape to attach to the front of card. Because the brown color is not suitable so use a white chalk marker to change the color of the flourish. The pink sparkling gem doesn't work so took it out. 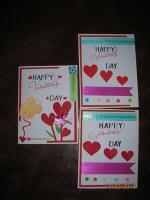 Sponge angel pink ink around edges of pink card as well as on the nice pink ribbon. Arrange paper flowers to have a pleasing look. Add pearl gems on centres of flowers. 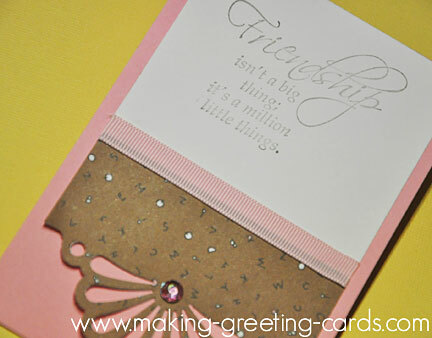 Overall, the final result of this pink Friendship greeting card doesn't look too bad, right? 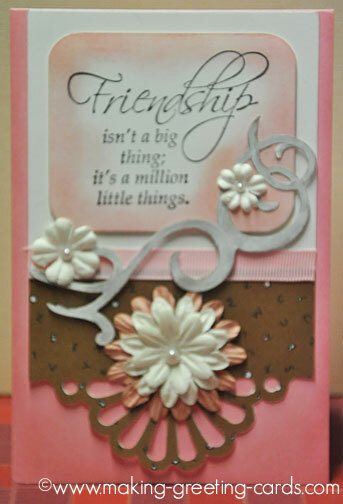 Click here to view a hand painted friendship card.